Experience the magic of Grand Canyon firsthand! 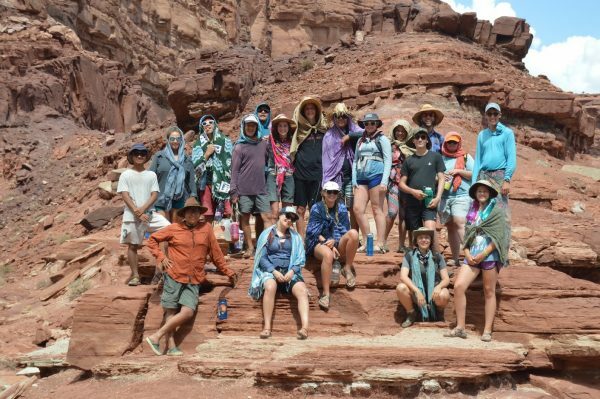 This expedition brings together youth from across the world to travel the Colorado River, raft legendary whitewater, and explore the hidden world beneath the rim. Off the river, you will hike to ancient Puebloan archaeological sites, trek up incredible side canyons, discover hidden springs and waterfalls, and sleep under the stars. This program is run in conjunction with the Grand Canyon Monitoring & Research Center – a branch of the United States Geological Survey – and has a strong science component. Assist scientists collect data for active research projects, while learning about the ecology, human impacts, and management of the Colorado River and Grand Canyon. Choose between either the Upper or Lower section of Grand Canyon. Both expeditions are truly one of a kind, and offer special ways to learn about and understand this special place! Check out both options below. Explore the majestic landscape of Utah while rafting one of the legendary sections of whitewater on the Colorado River: Cataract Canyon! This program is geared towards alumni of our Partners in Science programs, and focuses on the Colorado River Basin as a whole, challenging participants to think bigger about the rivers and canyons we love to explore. Extend lessons learned from Grand Canyon as you compare and contrast the ecosystem above and below Glen Canyon Dam. Before the trip, you will read and respond to a series of prompts to prepare. On program, create your own expedition journal and participate in discussion circles as you learn from the place, the guides, and each other. Come prepared to learn about your role as an outdoor enthusiasts and what it means to become a steward of public lands. Experience the beauty of the San Juan River in southeastern Utah! Middle school students from all over the country will come together for 6 fun-filled days of rafting, hiking, and much more. You will learn about the ecology, geology, and history of the San Juan Canyon. Our goals are to spark your curiosity, encourage everyone to ask good questions, and explore what interests you most while on program. On expedition you will work as a team to overcome challenges and form a strong river-community, becoming a wilderness leader as you learn to take care of yourself and your new friends in the outdoors. We believe participants have a more fulfilling experience if they earn their program. By working towards this trip, we hope you will be actively engaged and invested in the success of the program. To achieve this, we ask you to carry out three Pre-Trip Requirements: Educational, Service, and Youth Earnings. We recommend starting this process early! You’ll have a sense of accomplishment once you are finished. Each GCY Summer Expedition has an educational component. You are traveling to an incredible landscape, and learning about the ecology, geology, and history of that place is a huge part of your experience. Each expedition is unique, but expect to engage with a series of weekly emails throughout the spring before your program. These emails may ask you to read articles, respond to discussion questions, watch short videos or interact with other resources. We expect you to participate and be timely with your responses. Engaging with your home communities prepares you to be an active member of the GCY river community. You are expected to complete 2 hours of service per day you’ll be on expedition with us. For example, if your program is 8 days long, you would need to complete 16 hours of service. You can count any service you have done since the beginning of the year. Think creatively! Is there an outdoor space at your school that needs cleaning up? Could you organize a coat-drive for a local homeless shelter, or recruit friends to help walk and bathe animals at a local animal shelter? Have you ever noticed that when you work for something, it means more to you? That is the concept behind the Youth Earnings requirement. You are expected to find a way to raise or earn a portion of the trip fee. You have the opportunity to be as creative as you like: save money from your job, do chores for family and friends, sell art you make, sell old sports equipment or video games you no longer use, etc. What are we going to do out there? Being on the river is taking a break from the hustle of everyday life. You travel downstream in inflatable oar rafts and paddle boats, with motor boat support. Everyone works together, helping set up camp, do science projects, cook dinner, and wash dishes. You are a full participant in all aspects of river life! Each day you will move downstream, and each night you will camp some place new. What happens off the river can be as spectacular as the rapids! Come ready to explore side canyons- you may hike to historical sites or hidden waterfalls. Every GCY program includes a Citizen Science element, where you will assist in collecting data for ongoing research projects, and most Summer Expeditions will include scientist representatives from the USGS or National Park Service. GCY guides will also lead art projects, games, and leadership activities. Come ready to work & learn! Your group will include youth from across the country – sometimes from across the world! Each program has a Trip Coordinator, an adult leader in charge of helping you prepare and making your expedition successful! Your Trip Coordinator will communicate with you prior to the program and be your main group leader throughout the program. At the river you will meet your guide crew. These are experienced river guides who have a passion for working with youth. Many GCY guides are alumni of our programs! You will also likely have 1 or more scientists from the USGS or National Park Service facilitating a Citizen Science research project. Be sure to ask a lot of questions to all of these incredible human resources. How difficult will the trip be? It is important to be in good physical condition for this adventure. Building up endurance prior to your program is a good idea. You will be outside, active, and in the hot sun every day. This is part of the fun, but can be challenging. Besides rafting and hiking, plan on being involved in loading and unloading boats, packing and unpacking gear, and setting up and taking down camp. Hiking in the desert southwest is different from hiking anywhere else. Many hikes contain uphill sections over uneven terrain, near vertical drop-offs. It can be very hot and dry, or wet and cold. Some hikes include rock scrambling and require guide assistance. Hiking is an important aspect of the program, expect to hike a couple hours a day. 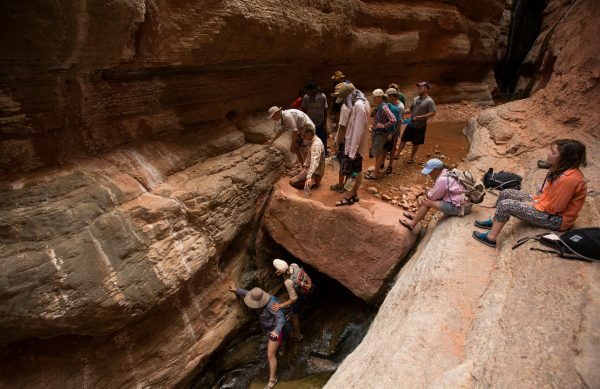 Youth on the Partners in Science programs will need to prepare to hike in or out of Grand Canyon via the well-maintained Bright Angel Trail, carrying a heavy pack. There are several places to stop, rest, and refill water bottles along the way and you are encouraged to go at your own pace. You will be responsible for carrying all of your clothing and personal hygiene items. The hike is steep, strenuous, and at high elevation. Think about it like climbing stairs for more than four hours! Most emergencies can be prevented by taking care of yourself and listening to safety guidelines. GCY guides are certified Wilderness First Responders, and travel with a satellite phone and extensive first-aid materials. If there is an incident, the GCY office will work with guides to organize any needed support and contact parents. If you are nervous about any aspect of the program, please contact us for more information. The weather on the Colorado Plateau is as varied and unpredictable as the place itself. Prepare for all kinds of weather. The Rim is in the 90’s by day but chilly at night. Temperatures on the river can be over 100 degrees Fahrenheit in the summer months. You should expect it to be hot, dry, and sunny. River water is refreshing and plentiful, so there is always natural “air conditioner” flowing right by you. Packing layers will help you to adjust to the range of temperatures. What if I do not have all the items on the Packing List? GCY has many items available to borrow in our Gear Room, from river shoes to rain jackets, we have everything on your packing list! Please check with us before purchasing any items! We understand that kids grow quickly, and purchasing outdoor gear can be a burden. The Gear Room is open Monday – Friday from 9am to 5pm, if you cannot make it here during those hours, please feel free to contact us to set up a time to come by! If you have more questions not answered here, please contact us. All Expeditions begin in Flagstaff at the Grand Canyon Youth office (2131 N First Street). If you are travelling from outside of Flagstaff on your own, please use this information to help you assist with planning your travel logistics. Phoenix Sky Harbor (PHX) is the closest, large airport in the area, and services most major airlines. If you choose to fly into PHX, please leave enough time to travel from Phoenix to Flagstaff and still arrive on-time for your expedition. If you need a shuttle from PHX to Flagstaff, we recommend using Arizona Shuttle (more information below). Be sure to look at shuttle times and double check that you will get into Flagstaff on time for your program before booking your flights. Flagstaff Pulliam Airport (FLG) is a small, regional airport and currently only services flights from American Airlines, connecting to Phoenix, Los Angeles, Dallas, and Denver. If you are traveling from within the Southwest region, there are some overland travel options as well! Arizona Shuttle (a division of Groome Transportation) is our recommended van shuttle service for traveling around Arizona. They have a wide variety of shuttle times and stops, and are very dependable. If you are flying into or out of Phoenix Sky Harbor, consider using Arizona Shuttle for the last leg of your journey to Flagstaff. If you are traveling to Flagstaff from elsewhere in Arizona, this is also a great option. Amtrak Passenger Trains arrive and depart Flagstaff on a regular basis. If traveling from New Mexico or southern California, this could be a good option for you! Amtrak Passenger Trains are typically at least an hour late, and may arrive or depart very early or late at night. Please plan plenty of buffer time to accommodate delays in train travel. Greyhound Bus is another option for traveling overland to Flagstaff. Youth traveling on their own via Greyhound should be experienced travelers and ready to navigate any bus changes on their route. Please Call GCY before booking flights, shuttles, or other transportation! While we are not travel agents, we can absolutely give advice and help double check dates and times with you. 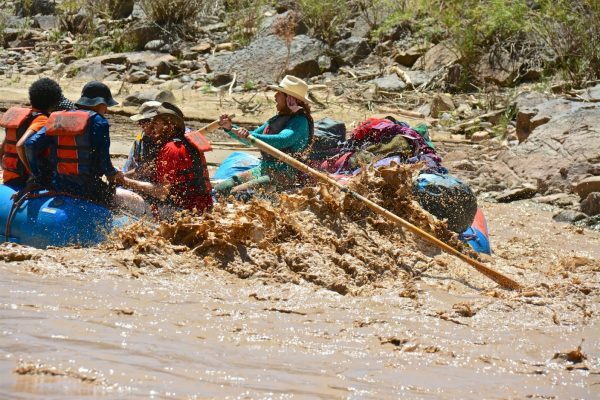 Flagstaff Pick up & Drop off: Grand Canyon Youth will have support staff available on days that Expeditions launch and finish to help pick up and drop off participants. If you are arriving to / departing from a Flagstaff location, like the Amtrak station or FLG airport, we can pick you up or drop you off from the GCY office. GCY Office Overnight: We highly recommend that you arrive / depart on the day your Expedition begins / ends; however, we know that travel arrangements can get complicated! In the event that you need to arrive the day before your Expedition begins or depart the day after your Expedition ends we can host you overnight at the GCY office. You will be supervised by a GCY staff member during this time, and likely assist in picking up and dropping off other participants. Please bring enough money for 2-3 meals, and have a cell phone to communicate with GCY staff while you’re traveling. You will be expected to adhere to the same behavioral expectations in town as you are on Expedition. Unaccompanied Minors: Airlines have specific regulations regarding youth traveling on their own. Most companies will allow youth of 15 years and older to travel on their own without special supervision requirements, but please research what restrictions might exist when booking flights. Travel Insurance can be helpful in the event of a missed or delayed flight, medical evacuation, or lost baggage. After Expeditions groups may want to coordinate a last lunch or dinner in Flagstaff. That’s great! Please do not congregate at the GCY office after your Expedition has officially ended, and understand that any participants staying overnight at GCY after the program must remain with GCY staff until their departure. Having the right gear and packing correctly is invaluable to your success and happiness on your Expedition! Please refer to the following documents to help you prepare and pack. Read carefully! If you do not have any items on the Equipment List, GCY has a stock of extra gear that you can borrow from. On all Expeditions, we recommend that you pack as lightly as possible. If you have any questions about which Packing List applies to your Expedition, please call our office. Be a minimum 10 years of age for the San Juan, Verde, Lees Ferry, Diamond Down and land-based programs, and 15 years of age for Grand Canyon and Cataract Canyon programs. Be able to manage all personal care and mobility independently, or with the assistance of a companion. Ability to independently board and disembark a boat four to ten times each day. This may require stepping into the boat, and then maneuvering your body over and across tubes and objects into a seated position. Ability to independently navigate shoreline terrain, including safely maneuvering around and across boulders, rocks, and slippery and uneven surfaces, under low branches, and around vegetation This includes the ability to maintain your balance near precipitous ledges or cliffs. Ability to independently maneuver in whitewater or swift currents while wearing a PFD. This includes being an active participant in your own rescue, including having the ability to (a) hold your breath while underwater, and regain control of your breathing when being submitted to repeated submersion under waves or currents; (b) orient yourself to new “in-river” surroundings; (c) reposition yourself in the water to different swimming positions i.e. turn face away from waves, breathe between waves; (d) swim aggressively to a boat or to shore in whitewater; (e) receive a rescue rope, paddle, or human assistance, and possibly let go of the same; (f) get out from under an overturned boat. Ability to maneuver 100 yards in flat water while wearing a PFD. Ability to comprehend and follow instructions given by guides in all situations, including during stressful or dangerous situations, and to effectively communicate with guides and other participants. Ability to carry personal dry bags and other personal gear (as heavy as 20-30 pounds) uphill from the boats, independently, or with assistance. If taking prescription medications, have the ability to maintain proper dosage by medicating independently, or with the assistance of an adult. Not have a psychiatric condition which has the potential to render yourself or others unsafe. Ability to sleep outdoors without artificial light. Not have an orthopedic injury that is less than six weeks past full healing, and/or which cannot be weight bearing. For some Grand Canyon programs, the ability to hike for at least 7 miles while carrying a backpack with a weight of at least 25 lbs. The above criteria, if not met, can disqualify a person from participating in a GCY program. This safety criteria exist for all participants. The criteria is not meant to discriminate against any physical or mental disability; it is applied uniformly to all potential trip participants, regardless of the presence or absence of a disability. There may be additional issues not listed here which may preclude participation in a GCY trip, including menu restrictions that GCY cannot safely accommodate. GCY is committed to making reasonable modifications to any trip for any persons so long as they do not fundamentally alter the nature of the trip. These criteria can be expanded as deemed necessary by staff or the medical or legal professionals assisting GCY. GCY reserves the right to exercise final authority over which individuals can or cannot join a trip. The following paragraphs further inform all potential participants of the expectations to promote a safe and enjoyable experience for everyone on a trip. There may be requirements, whether physical or mental, that are not specifically “essential eligibility criteria”, they are explained here to help participants understand the reality of being on a wilderness expedition. Our primary goal is to minimize risks associated with adventure trips in wilderness. The trip involves physical exertion and exposure to the elements, including cold water and the potential for heat, sun, wind, rain and snow. We have experience accommodating a wide range of physical abilities and/or health conditions. However, individuals with physical/mental limitations or ailments that interfere with the realistic encounters on wilderness river expeditions can endanger themselves, other participants, and the guides. GCY advises you to consult a doctor regarding medical or health conditions that could impact your ability to participate in this outdoor adventure. It is important that each trip participant take an active role in their own safety. All participants will encounter unfamiliar and dynamic wilderness conditions. It is critical to pay attention at all times, be aware of surroundings, and avoid taking unnecessary risks. Even a non-life threatening injury in a wilderness setting can become a major emergency, and can endanger the entire group. Swimming or hiking alone is not allowed. Using common sense, and following the explicit instruction of your guides is essential. River trips, particularly those involving whitewater, are inherently risky. The risk of a trip is part of what makes it an exciting adventure. It is important to stay calm as a non-voluntary swimmer. The odds of becoming a non-voluntary swimmer change with the classification of a rapid, boat selection and environmental factors. A swim in whitewater is more difficult and physically challenging than swimming in flat water. Swimming in cold water can cause a gasping effect on your respiratory system. Swimming in cold water quickly saps energy and decreases muscle function. While guides are highly trained and will do their best in a rescue situation, a successful rescue is greatly improved by a swimmer who actively participates and follows directions under stress. Experience the magic of winter with an overnight yurt trip! Cross country ski in the shadow of the San Francisco Peaks, and stay overnight at one of Arizona Nordic Village’s backcountry yurts. After a day of sliding around groomed trails, we’ll settle down by a wood stove for dinner to discuss Flagstaff’s winter economy, impacts to the environment, and the future of winter tourism in American mountain towns. Pedal through the pines! Partnering with the local chapter of Trips for Kids, you will explore Flagstaff’s fun single-track trails. Whether you’re a trail riding fanatic, or you only ride on concrete, you’ll find a way to push yourself and learn and develop skills on beginner and intermediate trails. Throughout the day we’ll discuss how the city, state, and federal governments protect and manage land for different human uses. Come explore East Clear Creek Canyon! Just outside of Winslow, AZ, this narrow, winding reservoirs cuts through a canyon of Coconino Sandstone. We’ll discuss human impact on wild places, learn about Leave No Trace principles, and participate in a service project to clean up this popular public space. This is a perfect introductory stretch of water to practice your kayaking skills and adventure outside of Flagstaff! Explore southeastern Utah on one of the main tributaries of the Colorado River! After a night camping at Navajo National Monument, you’ll launch on the river in Mexican Hat, UT and travel through a deep canyon, watching the landscape and geological layers change every day. You will have the chance to explore side canyons, enjoy swimming in secret desert pools, race across expansive sandbars and paddle exciting whitewater. Discover the Colorado River as it carves through the wilds of Canyonlands National Park in Utah. Start your journey enjoying calm waters that wind through Meander Canyon, as you pass through some of our nation’s most treasured public lands. After a few days of playing on calm water and hiking to cultural sites, you will float past the confluence of the Green River and enter Cataract Canyon. Rapids easily rival Grand Canyon’s and come in quick succession! At the end of your journey, drift across the flat water of Lake Powell and experience first-hand the effects of Glen Canyon Dam. Enjoy your trip back to Flagstaff, AZ as you continue to explore the Colorado Plateau, visiting several National Monuments and State Parks. After a night of camping at the South Rim of Grand Canyon National Park, Lower Grand Canyon programs begin by hiking down the Bright Angel Trail, descending 4,380 vertical feet over 7 miles! When you reach the banks of the Colorado River, you will meet your river guides and embark on your journey downstream! This stretch is markedly different than the Upper, as the river carves it’s way through the granite and schist Inner Gorge of Grand Canyon. The Lower will also lead you through some of the largest and most famous rapids in Grand Canyon, including Hermit, Crystal, and Lava Falls before you take out at Diamond Creek near Peach Springs, AZ. Your Upper Grand Canyon programs begin at Lees Ferry near Marble Canyon, AZ. Participants will work their way back in time, traveling through Marble Canyon into the iconic rock-layers of Grand Canyon. 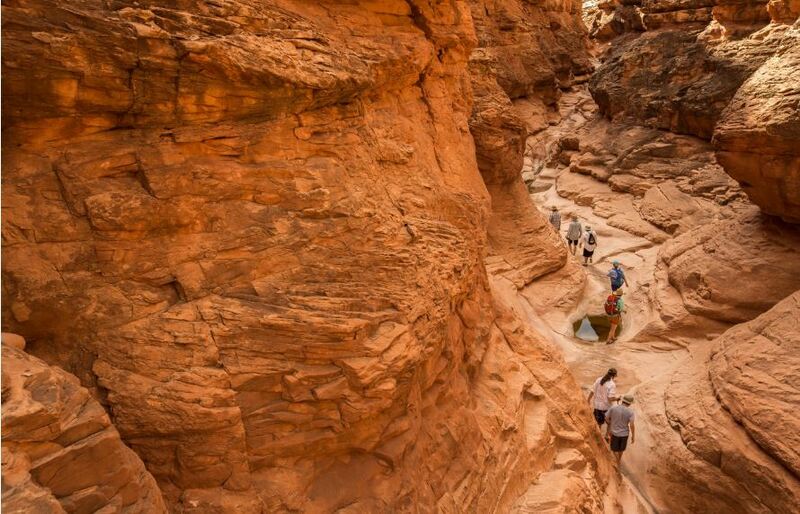 You will have opportunities to explore many of the unique sites that this stretch has to offer, including ancient granaries at Nankoweep, the expansive beach at Redwall Cavern, and the Confluence of the Little Colorado River. Upper Grand Canyon programs end with a challenging, 7-mile hike out of the canyon, via the Bright Angel Trail in Grand Canyon National Park.